BZA Bob's Zombie Apocalypse in 28mm: I'M BACK. MORE NEW STUFF AT THE BUNKER. I'M BACK. MORE NEW STUFF AT THE BUNKER. Well, April turned into an unmitigated disaster hobbywise, no that should be painting production wise. I think my mojo's broken, I just can't seem to sit down and paint anything. Having my son home for an extra week of Easter seems to have disturbed something in the force. That and I've been feeling really down. Although gaming wise the new Zombicide has had a serious workout, I must say that I'm really impressed with the new tweaks. The skinner zombies and new spawning rules make things a little more entertaining and less certain. Making everything more replayable. So, let's try and act like I've never been away, to continue with my relentless attempt to bring some culture into the world of zombies. Once again I present you with another amazing example by Bryan Baugh. This one is called We Caught One! Enjoy! I'm pretty sure this one is called We Caught One! Before charging off into the rest of the post, I must first go to the storage shed and wheel out the welcome wagon. It needs a little dusting off and a couple of squeaks oiled. So the welcome wagon is out for my latest couple of followers, first can we have a big BZA welcome for Ken Reilly. WELCOME KEN! Ken runs the Yarkshire Gamer blog, go check it out, everything from musketry to X-wing. No zombies though. The second BZA welcome goes out to Carvin' Joe. WELCOME JOE! Can't find a blog for you Joe, if or when you have one let me know. April turned into a painting wasteland. Motivation was at an all time low, the mojo tank was drained. Even amongst such desolation, there was a silver lining to some very dark clouds. My son, in an effort to cheer me up, did something that left me stunned. He bought me some Zombicide stuff. I say "some" stuff, he bought me loads. Firstly, he woke me up on Friday morning, telling me that I had some mail. 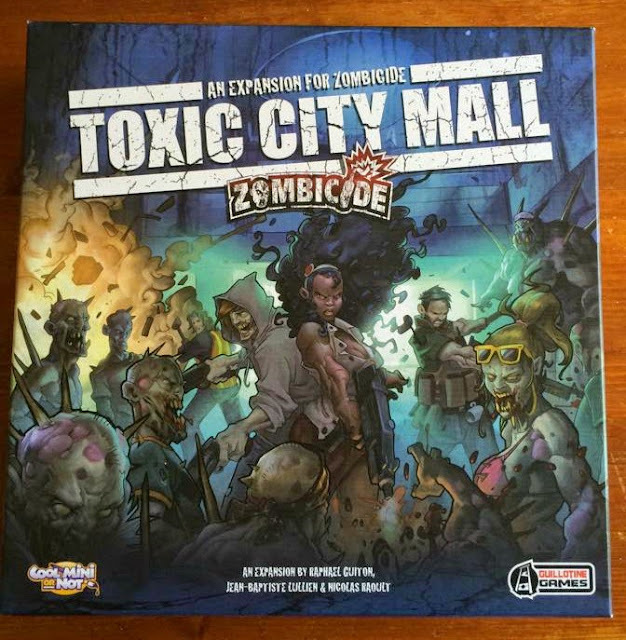 It was Toxic City Mall, the season 1 expansion for Zombicide. I thanked him profusely, much hugging ensued. I thought, WOW, what a great kid. Trying to cheer up his miserable old man. Little did I know just how great a kid he was being. So Friday was spent oohhing and aarrhhing over TCM. Saturday morning, same routine. 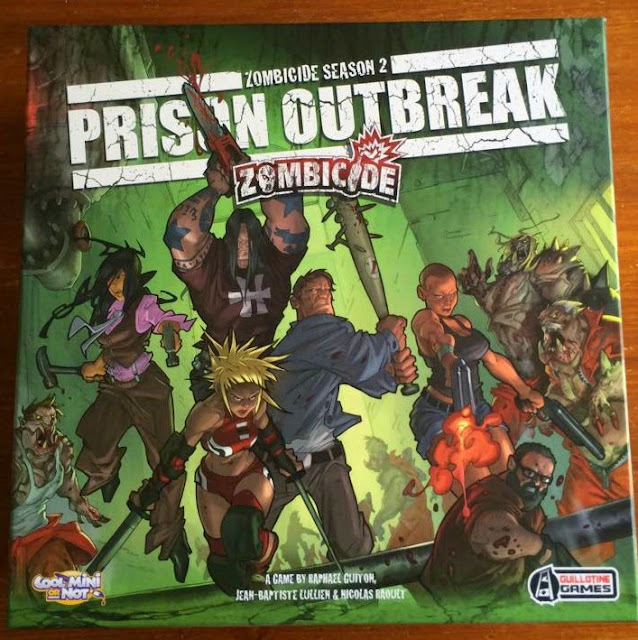 This time it was Zombicide season 2:Prison Outbreak. I was speechless, I told him to stop spending his money on me. More hugging and a few tears shed this time. As I was still going through the Prison Outbreak box, marvelling at all the plastic goodness, there was a knock at the door. My son ran to answer it, very unusual behaviour, returning with a beaming grin and another box. In that box was Uncle Honk and Mitch. Again struck dumb by such generosity, I hugged him fiercely and more tears were shed. I asked him why he had done it, he said he just wanted to cheer me up. What could I say? Well thanks for one. See, I told you he was a great kid. TWO MORE SURVIVORS TO TAKE BACK THE STREETS. As I mentioned at the top of the post, I think my mojo's broken. I just can't seem to sit and paint, the following W.I.P. pictures have taken me weeks to get to this far. And I now have a plastic mountain to climb. To that end, I'm going to challenge myself to paint all my Zombicide figures by years end, I just hope it's do-able. Does anyone know if you can buy bottled or canned mojo? I hate posting WIP pictures, but it was that or nothing. Still better than nothing eh?!? It's why I haven't posted, I've had nothing to post. A FEW SURVIVORS AND A COUPLE MORE SEASON 3 ZOMBIES. It's great to have all these new figures and games, now this may seem churlish, but it's kind of delaying my ATZ journey. I know that nearly all these mini's will be pulling double duty and appearing in my ATZ games, so maybe it's not going off on too much of a tangent, but it feels like I'm not making any progress on the original plan. Anyway, enough whining, I'll just have to "nut up or shut up". I guess that's all I got for this time dudes and dudettes. So, until next time try and follow in the footsteps of the DUDE and "take it easy". Glad you're back, I had a slow April too. Mine was more dead in the water than slow. I'm sure the new Royal sprog will be more than able to buy it's own copy of Zombicide, out of Mater and Pater's free money. Yeah, he's a good kid, makes me proud. The paintbrush needs to do something, like kick me up the arse. 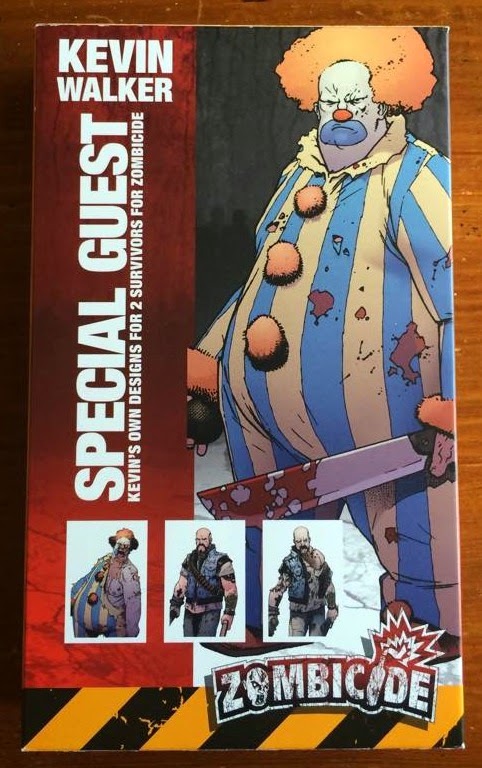 Clowns are scarier than zombies and could probably take them any day of the week. You've got a great son there Bob. I've been doing nothing but posting WIP pictures lately Bob its good to see yours. He's something else, that's for sure. I don't like posting WIP shots, I just haven't got the motivation to paint at the moment. You're a lucky man Bob.........but I guess you know that already! I'm a very lucky man indeed! You are very lucky to have such a loving and generous son. Those are all excellent additions to your Zombicide haul. You're going to have loads of great times playing the new scenarios and, when your mojo returns, painting all those lovely new figures. It is a shame that mojo can't be bottled because mine is simply overflowing and I wish I could spread it around! I couldn't wish for a better boy. My Zombicide haul is terrific, already playing with the new stuff. I've been battling depression for a long time now, sometimes it can just all get on top of you. I'll come out the other side eventually. A great kid AND a bushel of new minis. Outstanding. He's a top boy. A bucketful of mini's. Truly outstanding. He's a very kind young man. You may have to wait a while, my boy's 20 in a couple of months. Take the time to recharge, and start up again. You'll get your mojo back, just give it a little nurturing! I'll take your very good advice and hopefully things will improve. The Zombicide fun should last a long time yet. Yeah, definitely glad to put April behind me. Hopefully can kick on and get something done. Let's hope May is indeed a better month for everyone. You have a wonderful son Bob, and welcome back zombies and all. It's good to be back, yes he's a great kid! Don't you worry about WIP posts, after all that's all I'm managing at the moment and at least we know you're still out there. That's some task you've set yourself there Bob, best of luck Sir. I'm not worried about WIP posts, I just don't like doing it. Seems bad form old chap. The task at hand is partly masochistic. By the way, congratulations on your knighthood! Not sure where the knighthood nonsense started, but it does have a ring to it! :D Keep going Dude! Ha, great work raising your son, Bob. His old man must have done something right! That is a lot of new plastic to paint and I think best motivation would be just knowing you HAVE to paint it if he went through the trouble buying it for you. Things like this usually help me. I'm keeping myself occupied with other things, but maybe watching some related films would also get you motivated again. Then again, there's playing games - nobody should be playing with unpainted miniatures, so that's another mojo trick. Lastly, perhaps paint only 4 at a time? Yeah, he's a great kid. I'm starting to paint the plastic mountain, 4 at a time seems to be working at the moment. Slow and steady wins the race. That's awesome.. . Kudos to the young gent for looking after his dad! Perhaps sit and plan an event such as a platoon of soldiers moving though an infested neighbourhood full of zombies say for halloween and make up some fun rules for all the different zombies you now own. Then sit down and and plan to paint say half of each type of zed you have for it. I am in similar position at the moment and am finding it difficult to stay focused on anything I just keep drifting between projects. He's an awesome young man. That's a really cool idea dude! My focus is out of focus at the moment too. 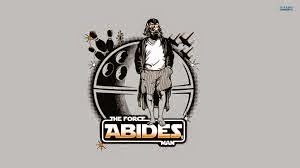 We must all abide dude!